Indian hair extensions are extremely popular, not only in the African American community, but worldwide. They look great and can be washed, curled and straightened like your own hair. Have you ever wondered where that hair comes from? What does a hair factory look like? Indian hair extensions are sometimes referred to as “temple hair”, because a great deal of it comes from donors who offer their hair to the gods as part of a ritual. 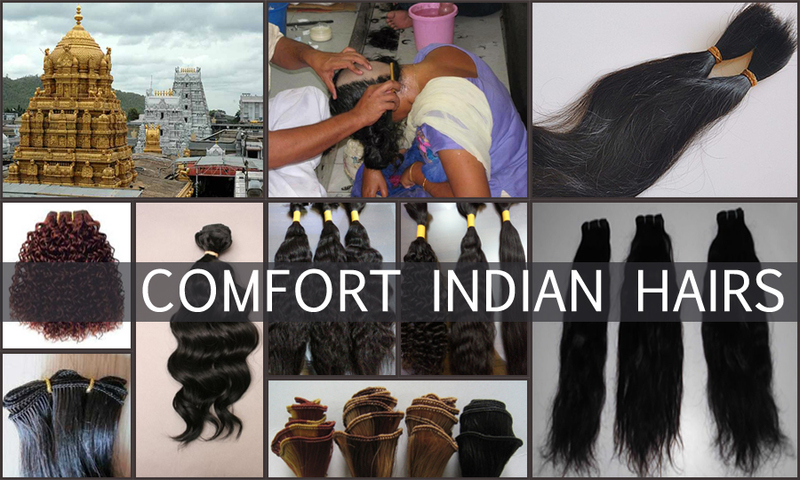 Comfort Indian Human Hair procurement team is responsible for bringing the Non Remy Indian women hair from temples from south india to our warehouse at Cuddalore, India. Once the hair is shaved off, the team collects and ties off hair from single head as a bundle. If a bundle is found distorted, it'll be discarded. Hair from single head’ ensures the heads and tails are aligned in one direction thus giving a Remy and cuticle intact hair. But Sometimes, Hair from Multiple heads will be bunched up to make an even weight as 100 Gms/Bunch. The Hair we pick is from Indian women aged between 18 to 25 Years, it ensures elasticity and improved quality. Our skilled quality analysts with decades of experience perform meticulous check on our hair at warehouse. Hair bundles with colouring/dyeing substances on it are identified and discarded. Remaining virgin hair bundles are picked and separated according to their pattern (curly, wavy or straight). In manufacturing unit, the hair is wefted where one end of the hair is trimmed and stitched using superior quality threads. We use triple wefting technique to make sure the shedding is minimal, close to zero. A two step process in followed to remove the nits. A team picks the nits using specially designed combs and physically using finger nails. Nit Free Lice Treatment is nontoxic, pesticide-free, and proven to eliminate lice and their eggs (nits) in just one treatment. Nit Free Lice Treatment products use a combination of natural, safe, and active enzymes to remove head lice and nits without the risk associated with pesticide poisons. Then the hair is washed with Shikakai which has been traditionally used for hair care in India since ancient times. Shikakai comes from ayurvedic medicinal plants and has no chemicals. This makes sure our hair is nit free and not processed chemically. Finally Every Pack of the Hair is washed and dried. Out of 10 KG of hair that we procure, only 6.5 KG comes out as finished hair and hair extensions on an average. Rest is rejected for various quality reasons. We are proud of having such rigorous quality checks so that our customers get the best hair. We also check the elastic Strength by Manually Checking the Package. We Select the Product based on Sizes from 8 to 32 inches.